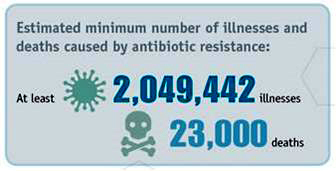 Antibiotic resistance is one of the most pressing health issues facing the world today. The President’s FY 2016 Budget submission calls for nearly doubling the amount of funding for combating antibiotic resistance to more than $1.2 billion for the Departments of Health and Human Services, Agriculture, Defense, and Veterans Affairs. For CDC, the budget submission calls for $280 million to support antibiotic stewardship, outbreak surveillance, antibiotic use and resistance monitoring, and research and development related to combating antibiotic resistance. The new investments are detailed in a fact sheet released today. The Centers for Disease Control and Prevention (CDC) estimates that each year at least two million illnesses and 23,000 deaths are caused by antibiotic resistant bacteria in the U.S. alone. Antibiotic resistance limits our ability to quickly and reliably treat bacterial infections, and could hamper our ability to perform modern medical procedures. In addition, resistant infections account for $20 to $35 billion in excess direct health care costs and up to $35 billion in lost productivity due to hospitalizations and sick days each year. And spur at least a 25 percent reduction in the rate of multi-drug resistant Salmonella infections and pediatric and geriatric antibiotic-resistant invasive pneumococcal disease. The proposed investments will lead to critical new interventions that could transform how public health prevents the transmission and emergence of antibiotic resistant infections.